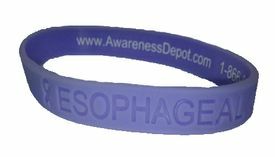 Esophageal Cancer Awareness Silicone Bracelet. This standard adult size bracelet is periwinkle in color and has an awareness ribbon on each side of the wording. The wording says "ESOPHAGEAL CANCER AWARENESS". It is debossed like the LIVESTRONG bracelet. Available in both Youth and Adult sizes. Measures 8" around for Adult size, 7" around for the Youth size.